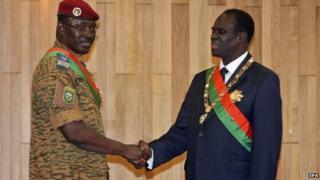 The authorities in Burkina Faso have appointed an army officer, Lt Col Isaac Zida, as transitional prime minister. Col Zida had been among officers who took power when then President Blaise Compaore was forced to resign on 31 October during mass protests. He declared himself head of state but on Tuesday oversaw the swearing-in of former Foreign Minister Michel Kafando as interim president. The moves followed agreement on a year-long transition to elections. The transitional charter imposes tight controls on the powers of Mr Kafando, who was the army's choice as interim leader. The document calls for an interim legislative chamber to be installed until elections next year. Col Zida is now expected to hold talks on forming a transitional government. The appointment of Col Zida has received a mixed reception in Burkina Faso. This week, he pleased part of the population by issuing several decrees - one entailed sacking the director-general of the national electricity company, whose inability to ensure a continuous supply of power has been regularly criticised. But for many analysts the presence of Col Zida at the head of government is a sign that the military intends to remain master of the transition process. It became clear last week that the army would hold back from taking the post of interim president and would instead lead the government. The man later appointed interim president, Michel Kafando, was the military's candidate. Analysts say there will have to be genuine power sharing if the country's stability is to be improved. Mr Compaore first seized power in a coup in 1987 and went on to win four disputed elections. Tens of thousands of people took part in protests in Ouagadougou in October over moves to allow him to extend his rule. Correspondents say the army has been given credit for averting chaos but the appointment of Col Zida may raise doubts about its promise to restore civilian rule. Some people also regard Col Zida as part of the old order - he was a senior officer in Mr Compaore's presidential guard. Before Col Zida's appointment, the United States and some other countries urged the military to hand back power to civilians or face the prospect of economic sanctions. The US said Burkina Faso should "select individuals to serve in the transitional government who are firmly committed to a democratic, civilian government".